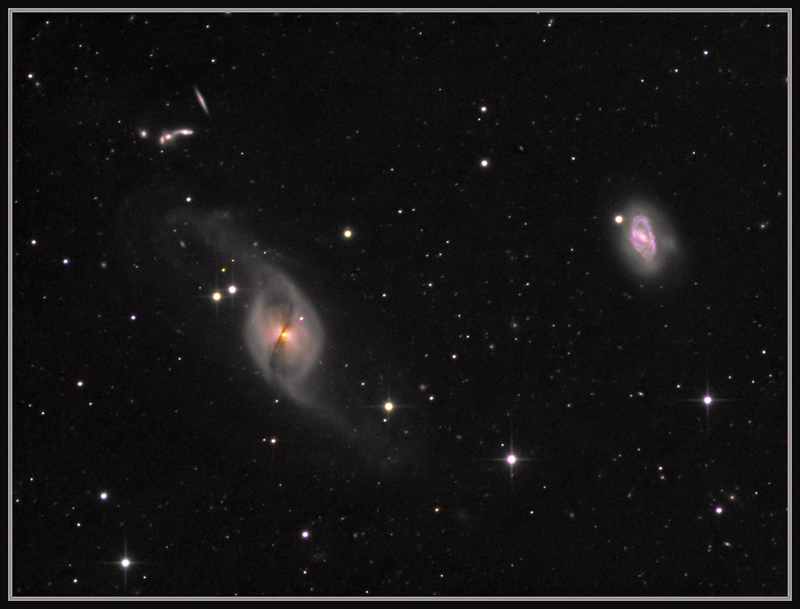 Galaxies galore in this image, the main being NGC 3718, NGC 3792, and the Hickson 56 (Arp 322 )group. Tha larger of the galaxies here, NGC 3718, is being warped by gravitational tidal effects from NGC 3729, which is only 150,000 light years away from it. These 2 galaxies are 52 million light years from us. The Hickson 56 group of 5 interacting galaxies in the upper left of the image lies at the enormous distance of 400 million light years, so the light that hit my detector left between the end of the Devonian epoch, when fish and amphibians first appeared, and the beginning of the Carboniferous epoch, when the swamps that gave rise to coal existed. Imaged on the 15th,22nd & 23rd March 2009 with a TMB 152 and Atik 16HR. Green & Blue24 x 240 seconds binned 2x2.